A reuben sandwich done quesadilla style with corned beef, sauerkraut, russian dressing and plenty of melted swiss cheese. The first thing that I think about when I have leftover corned beef is reuben sandwiches which are among my favorite sandwiches, but I was looking to change things up a bit. There was this half finished package of tortillas just sitting there begging to be used and I knew what I had to do, reuben quesadillas. I figured that a simple, straight translation of the sandwich recipe to a quesadilla recipe would be the best (It’s too bad there aren’t any rye tortillas around. ), though I did saute the sauerkraut a little because I did not want a soggy quesadilla. I also warmed the corned beef up just a bit as I envisioned a nice and thick quesadilla and I did not want the center to be cold. The quesadillas version of the rueben turned out really well! The lightly toasted tortillas worked just as well as bread at holding this amazing flavour combination together. I made sure to keep all of the cheese near the tortillas to ensure that it all melted up nicely and it came out really ooey, gooey and stringy and good! Melt a touch of butter in a pan over medium heat. Place a tortilla into the pan, swirl it around in the butter, set it aside and repeat with the second tortilla leaving it in the pan. Sprinkle half of the cheese on the tortilla followed by the corned beef, sauerkraut, russian dressing, the remaining cheese and finally the other tortilla. Oh my – that looks delicious! Sounds like a wonderful way to use up your corned beef. you are such a rockstar! love this. i made a reuben calzone and now MUST make this. I never would have thought of making one of these. They sound wonderful! I like the idea of using flour tortillas to make Reubens. I always only think rye bread. I need to get with the program. This looks ownderful. Hmmm. Looks like I lost my comment. if there are two comments that post, my apologies. I really like the idea of using flour tortillas to make reubens. I need to get with the program, because my thinking is narrowly focused only on rye bread. Funny thing is…as I was eating my leftover corned beef and cabbage today at work I thought to myself "I should make a reuben quesadilla." Then my second thought was, "that sounds just like something I would see on Closet Cooking"…it looks awesome and I have all the ingredients so it will probably be dinner tomorrow! Thanks for posting! Yum. I love the fusion of flavors here. Sounds like an upscale twist on bar food. I love this idea! You've got a nice creative streak going with the corned beef! I'm a vegetarian, hate sourkraut, but the quesadillas look good! I would make corned beef just for these sandwiches, never mind the leftovers…. Perfect corned beef fusion dish. Gotta love melted cheese. I'll be making corned beef this Sunday and although I bought some rye will try the quesadilla too. I was going to make the same suggestion that Dave did about adding caraway seeds to the sauerkraut. I wonder how my sliced not grated Swiss is going to work. Cook on!! What a nifty way to finish off the corned beef! That is one to try! Another original pairing! So yummy looking! YUM. I'm making my corned beef this weekend, and this will definitely be at the top of the leftovers list! All of you folks making corned beef this week caused me to take corned beef and smoke it into pastrami today. So looking forward to the Reuben tonight. But quesadillas are a great idea for tomorrow! I would have never, ever come up with this combo, but now that I've seen it, I have to try it. Just found this surfing around…I happened to put a corned beef in the SC this afternoon…Tomorrow I am making some GF tortillas and having this! 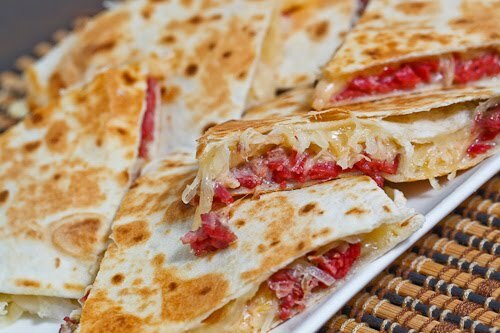 Reuben quesadillas – absolutely brilliant.. I always have tort's in the frig.. and I love ruebens.. Great idea.. I will try this..
You are a genius when it comes to any type of melted cheesiness! I love your blog and now have a lot of friends and family following. I noticed that you don't have any german recipes. I have been trying to find a recipe for a traditional Jagger Schnitzel. Do you have one by any chance ? kathleen: I have been wanting to learn more about German cuisine! Unfortunately I do not have a recipe for Jagger Schnitzel, but now I will have to look for one! Kevin, this looks so incredibly yummy! Thank you for this recipe. And the photo is wonderful! Some caraway seeds sprinkled in would help make up for the lack of rye bread. This looks so good! I will definitely have to try it.